First, think about the most suitable structure for your sharing relationship. If there are likely to be, say ten or more parties, it is better to hold the property in a limited company and buy and sell shares in it. That way, ownership of the property itself never changes. However, running a company does cost money and requires formal documents and procedures to be made and carried out. 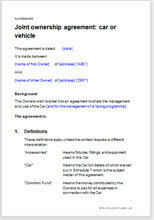 If you chose the more informal agreement, a document like one of these is perfect. Even if ownership of your car is registered in a company, the company documents will not record the shares in which the car is held. If you own 60% and I own 40% we have to record that in another document. If we do not the law will assume we own in the shares in which we contributed to the purchase price. These Net Lawman agreements specifically record the shares, so they are also incredibly useful even if you choose the company option. They also record shares which may be owned by someone who is not a registered owner. This is called a beneficial interest or fractional ownership.